Background: Cellulolysis is of considerable economic importance in laundry detergents, textile and pulp and paper industries and in fermentation of biomass into biofuels. Objective: The aim was to screen cellulase producing actinobacteria from the fruit orchard because of its requirement in several chemical reactions. Methods: Strains of actinobacteria were isolated on Sabouraud’s agar medium. Similarities in cultural and biochemical characterization by growing the strains on ISP medium and dissimilarities among them perpetuated to recognise nine groups of actinobacteria. Cellulase activity was measured by the diameter of clear zone around colonies on CMC agar and the amount of reducing sugar liberated from carboxymethyl cellulose in the supernatant of the CMC broth. Further, 16S rRNA gene sequencing and molecular characterization were placed before NCBI for obtaining recognition with accession numbers. Results: Prominent clear zones on spraying Congo Red were found around the cultures of strains of three groups SK703, SK706, SK708 on CMC agar plates. The enzyme assay for carboxymethylcellulase displayed extra cellulase activity in broth: 0.14, 0.82 and 0.66 µmol mL-1 min-1, respectively at optimum conditions of 35°C, pH 7.3 and 96 h of incubation. However, the specific cellulase activities per 1 mg of protein did not differ that way. It was 1.55, 1.71 and 1.83 μmol mL-1 min-1. The growing mycelia possessed short compact chains of 10-20 conidia on aerial branches. These morphological and biochemical characteristics, followed by their verification by Bergey’s Manual, categorically allowed the strains to be placed under actinobacteria. Further, 16S rRNA gene sequencing, molecular characterization and their evolutionary relationship through phylogenetics also confirmed the putative cellulase producing isolates of SK706 and SK708 subgroups to be the strains of Streptomyces. These strains on getting NCBI recognition were christened as Streptomyces glaucescens strain SK91L (KF527284) and Streptomyces rochei strain SK78L (KF515951), respectively. 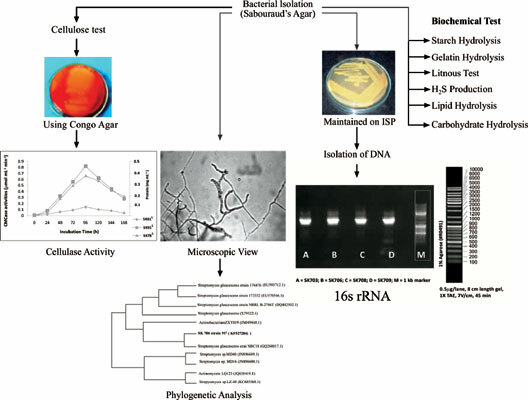 Conclusion: Conclusive evidence on the basis of different parameters established the presence of cellulase producing actinobacteria in the litchi orchard which can convert cellulose into fermentable sugar. Actinobacteria, carboxymethylcellulose, cellulase, Streptomyces, 16S rRNA gene sequence, litchi orchard.